What is the most desired smart tech amongst Brits? 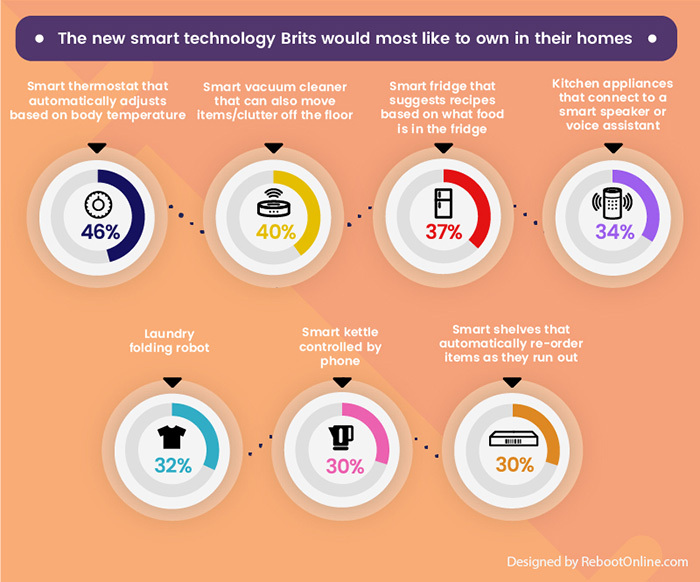 Home > Around the Industry > What is the most desired smart tech amongst Brits? In a world where people are busier than ever before, convenience and speed have become very desirable commodities. Luckily, the emergence of various technology has enabled individuals to spend less time on mundane everyday tasks within the workplace as well as their own home. Some of the biggest technological developments have come from WiFi enabled devices (e.g. smart speakers, smart thermostats etc.) that can function and be controlled in conjunction with one another to create a ‘connected’ working or living environment. Such devices have captured the imagination and wallets of consumers. So much so, that 40% of Brits now think smart home technology has improved their standard of living, according to statistics from ‘Thomas Sanderson’. Interested in emerging technological trends, RecycleZone.org.uk analysed the latest findings from ‘Mindshare’, who surveyed more than 6,000 Brits to identify the new type of smart technology they would most like to own in their home. RecycleZone.org.uk found that a smart thermostat which automatically adjusts based on an individual’s body temperature (46%), is the smart technology Brits would most like to have in their home. Thereafter, a smart vacuum cleaner that can also move items/clutter off the floor (40%), is the next highly desired smart device that homeowners will happily purchase and use. Interestingly, 37% of Brits are attracted by the concept of a smart fridge that suggests recipes based on what food is in there. 34% want kitchen appliances that can connect and be remotely controlled by smart speakers and/or voice assistants. Surprisingly, 32% are drawn to the appeal of a laundry folding robot. On the other end, a smart kettle which can be operated by a phone (30%), is the smart tech product individuals would feel least inclined to acquire for their property. Equally, just 30% are tempted by the idea of fitting smart shelves that can automatically re-order items as soon as they run out – though as people gain a better understanding of their functionality, smart shelves popularity will surely rise over the next few years. Furthermore, Recycle Zone (from the report) also sought to determine how open the British public would be to harnessing technology in different life situations. From this, it was discovered that Brits would be most open to watching a theatre production or concert livestreamed to their local cinema (43%). Similarly, 37% want to experience a concert or event from the comfort of their sofa via a Virtual Reality (VR) headset. Additionally, 35% are keen to try an interactive shopping method - whereby they can buy the clothing people are wearing on TV through an app in real time. Contrastingly, only 27% would plan to virtually meet up with their friends to play games using a VR headset. Slightly above, 29% have a preference to live video chat with a sales person as opposed to physically going to talk to them – this way also avoiding the issues typical associated with in-store shopping, such as long queues and lack of parking. Shawn Hallums, a spokesperson from RecycleZone.org.uk commented: “Technology has significantly evolved. We are in the era of instant gratification - where people want to utilise technology that makes different aspects of their life easier and more efficient. Companies have quickly realised this and created a multitude of devices and applications to cater to this apparent need. Now with a plethora of innovations available on the mass market, many of them have proved to be hugely popular and valuable. As existing as well as new technology advances and develops, consumers expectations will undoubtedly grow. This research highlights the new wave of smart technology which is exciting Brits the most. Certainly, enough to want to own and use them in their living environment”. What tech do Brits want most at work? Are You Ready for Generation Z?